One of the challenges of being a part of a global company with many offices is building trust. Trust increases collaboration and helps us find solutions and deliver value faster. Having the opportunity to build commonalities and shared experiences helps build that trust. 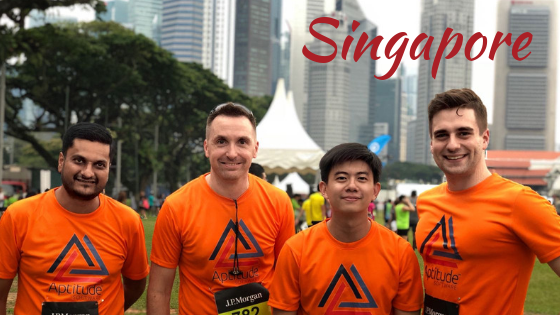 The global JPMCC has been a fantastic opportunity for us to run, walk and have fun together. Our London office has been participating in the challenge for the past four years, and as our team has become more global, the event has become something that brings the company together. This year we saw our biggest ever global office participation. Chris Roberts, who introduced JPMCC to Aptitude Software, reports that from a team of just over 350 people we had 50 participants join the challenge together this year! The water cooler discussion even extended to inter-office rivalry across oceans, Skype calls of encouragement, and post-race commiseration when we realize some of us are younger in spirit than body! ...to the 50 participants this year from our five global offices. Congratulations to our Aptitude Software global teams! Let's keep on running together.